Their Ad-serving technology is optimized for user experience, and is integrated in over 450 mobile and web applications. They serve more than 1 billion ad requests every day to millions of users with a minimal latency. They embraced the Cloud-First spirit by being 100% hosted on AWS from the beginning and they are using over 50 services to create a cutting-edge technology solution. Nowadays, Ad Tech companies have to handle huge traffic volumes to deliver Ads. They focus on high quality Ads by controlling traffic and bidding on partner programmatic platforms. This strategy reduces the payout per Ad request and therefore limits the revenues of the company. Learning user behaviors and optimizing traffic quickly became inevitable, so they gathered a R&D team to build Machine Learning algorithms. User data is processed using an Amazon EMR cluster, running every month and processing tens of billions of user events. Amazon S3 is the primary choice for storing raw data (hundreds of terabytes). 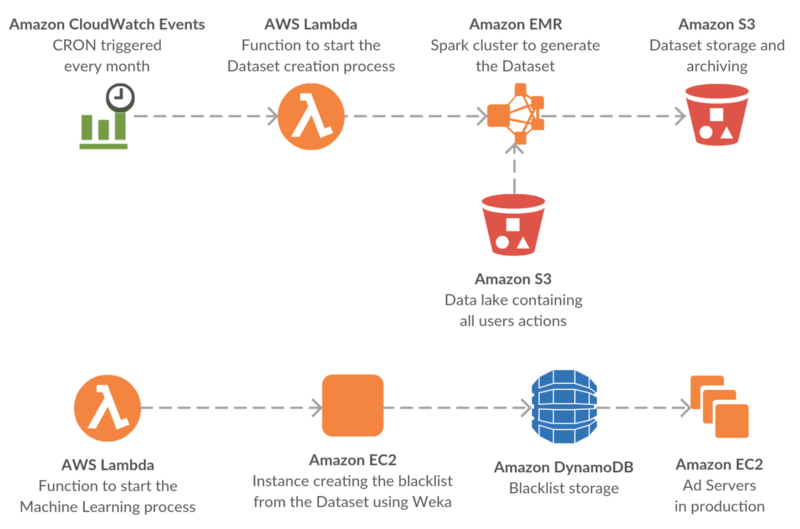 An Amazon EC2 instance, packaged with Machine Learning libraries, uses the monthly generated dataset to update the currently trained model and prepare a blacklist, that is loaded in Amazon DynamoDB for high traffic reads. The ML algorithm detects and filters 60% of total traffic being not relevant. The R&D team continuously improves its accuracy. AWS infrastructure costs are reduced by 45%. The company is reinvesting this money into new services and quality improvements. Ads get rendered 7x more often, meaning users have a better experience while watching ads in mobile applications. Higher Ad partner trust and Ad revenues. A direct impact is a visible growth in partner integrations and market visibility. Paris, September 25th, 2017 – TeamWork, specialized in consulting, integrating, outsourcing of SAP solutions and technology platforms, announces the acquisition of Corexpert, Amazon Web Services specialist and pure player. This unique complementarity allows TeamWork to strengthen its position in the cloud computing market in France and worldwide. Amazon Web Services (AWS), a cloud computing pioneer, provides a wide range of services enabling all types of customers to accelerate the deployment of their infrastructures and business applications. It is also the only cloud computing provider meeting all performance and security requirements to be SAP-certified. Thus, project deployments are accelerated and customers benefit from agility and flexibility, so far reserved for the web industry. Known as an expert in consulting, designing and building AWS Cloud infrastructures, Corexpert brings its expertise, experience and DevOps approach to TeamWork. Certified AWS Advanced Consulting Partner, Corexpert technical team develops, deploys and maintains in operational condition solutions for their customers, based on the most innovative managed services from Amazon Web Services, while continuously optimizing TCO. TeamWork, a strategic partner in digital transformation, operates in four core businesses: Business Consulting, SAP Business Solutions, Technology Platforms and Data Analytics. Recognized by its clients for its expertise and experience, TeamWork supports both major international accounts and SMEs. TeamWork’s 15 international locations allow it to guarantee 24/7 technical and functional outsourcing support services and geographical proximity to its customers. “Corexpert has allowed us to accelerate our deployment on the AWS Cloud and the Time to Market of Orinox’s SaaS Graphics Workstation (OCWS) offer. The synergy between TeamWork and Corexpert confirms their ability to support us in our client projects (large French and American energy companies) both internationally and with 24/7 support services” Maxime Fourreau, founder and CEO of Orinox. The acquisition of Corexpert by TeamWork is part of a strategy to develop an AWS Cloud competence center to address emerging new needs, such as IoT, Big Data and Blockchain, which are growth levers for digital transformation. The collaboration with Corexpert, started several months ago, also enabled TeamWork to consolidate its position as an SAP integrator on the AWS platform. TeamWork and Corexpert will discuss their partnership at the USF convention on 4 and 5 October at the Lille Grand Palais and during the Transformation Day on November 8 at the Salle de la Mutualité in Paris. TeamWork and Corexpert will also be attending the AWS re:Invent in Las Vegas from November 27 to December 1st, 2017, bringing together more than 40,000 Amazon Web Services customers and partners. Corexpert, a pure player of the AWS Cloud, was founded in 2006. Cloud Native company, its team of 20 collaborators consists of Developers, DevOps and Cloud Computing Architects. They have built their expertise on multiple customer success projects, in particular with the Amazon Web Services Cloud that Corexpert has been using since 2010. AWS Partner since 2014, then Advanced Consulting Partner in January 2017, Corexpert assists its customers in the usage of Cloud computing with a constant support, and ensures the skill improvement of customer teams in the daily usage of AWS managed services. Actors of the transformation of IT organizations, Corexpert team develops the best AWS Cloud strategy with their customers, accompanies them in the adoption of DevOps, automates their cloud computing infrastructures and offers dynamic and proactive supervision.